The jumping arts aren't as well-developed here in Korea as in the West or Japan. 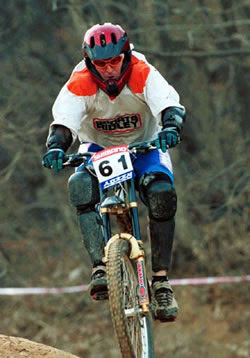 DH races are held in conjunction with the XC races, a little less often than once a month from March to November. There are no DS races yet. There is no BMX scene whatsoever (although there is a very small group of freestylers), and one BMX shop that I know of, which is in Ilsan. There are occasional trials competitions and a handful of riders. I race DH here in Korea, in the pro class, along with one other expat. This doesn't mean we could race pro back in the US, but it means we've won in the only other DH class here--beginner. So there are only two classes, and the race courses, which are absolutely easy, are the same for both classes. Some courses are just simple dirt roads, and I avoid those races because I'd rather just ride some great singletrack around Seoul. In the pro class, there are about 25 racers nationwide, and twice that in the beginner class. There are no separate categories for age, although sometimes students have their own category. Races usually cost 10,000 won and include lunch. You can hop on someone's shuttle for practice runs. Starting times and races tend to be disorganized; although the situation is improving, the race dates themselves always seem to change. Courses, which are usually not designed by DHers or even cyclists, are changed at the last second, often without input from the racers themselves, in violation of UCI rules (in one case all the racers were at the starting line for the seed run and no one told us the track had been rerouted onto another track two-thirds of the way down...surprise!). Anyway, a good time can still be had, since all the racers know and help each other, and you'll be going up against the Korean national team members. It's strange that there are no challenging DH race courses at the advanced level, because Korea, and especially Seoul, is full of full-on descents, with steeps, ledges, big rocks, chutes, hucks, berms, and so on. Oh well. If you want to race DH here, almost any bike with DH tires will do. Perhaps bringing a triple chainringed freerider is the best bet for an expat who is only going to be in Korea for a year or two, since there is only one lift-served singletrack (Phoenix Park ski resort, Kangwon Province) in the entire country, and few shuttle options. You'll spend a lot of your time pedaling or pushing uphill. Korean trails are typically not undulating, but rather all up or all down, and steep, which is perfect for freeriding or DH. Park Sung-min, who runs a little shop in Suwon called MTB House (1 hour south of Seoul by subway), and who is one of the top DHers in the country, can be contacted for current DH info. Limited English, but a good guy and a good resource.